In my last post I told you about the exciting project Im working on with folks around the country, and now world, who are interested in editing wikipedia so that it better reflects the diversity of our living. I was on Al Jazeeras The Stream talking about problematic representations of Black women in the media when the folks there learned about the #tooFEW initiative. We did another interview about #tooFEW and we talked about some of the backlash wed received. As more folks learned about the project, more folks are interested and more folks were hateful. I fielded some tweets that were a little dismissive but what was most surprising was looking at the page announcing our event. Someone edited our wiki event page, changing the location to DICKS. 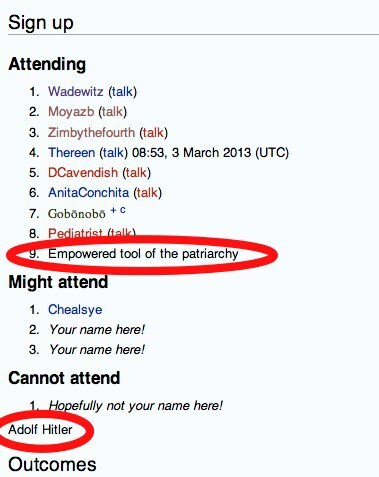 They or another person also trying to discredit our event signed up empowered tool of the patriarchy to attend as well as deleted all of our pages to be edited, replacing them with Adolf Hitler. What was initially an opportunity to empower marginalized voices through proactive action, now further illustrates the necessity of itself and other projects like it. 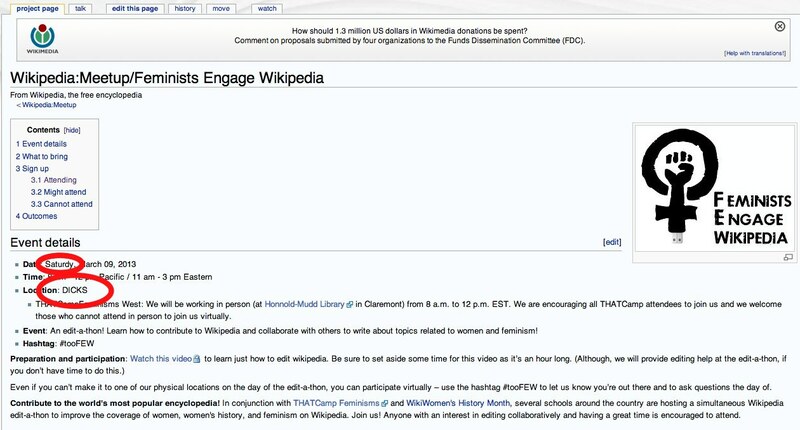 By editing the Feminists Engage Wikipedia page in these ways, patriarchy is proved real. Clearly some editors of wikipedia have the very biases we are attempting to counteract with our edits. If you look at our retrieved list of edits (thank you Wikipedia for your extensive history features, and we can see your IP address when you do stuff like this) most of what wed like to do is add people and ideas that arent present on the site currently. We are editing entries that are relevant to our communities. 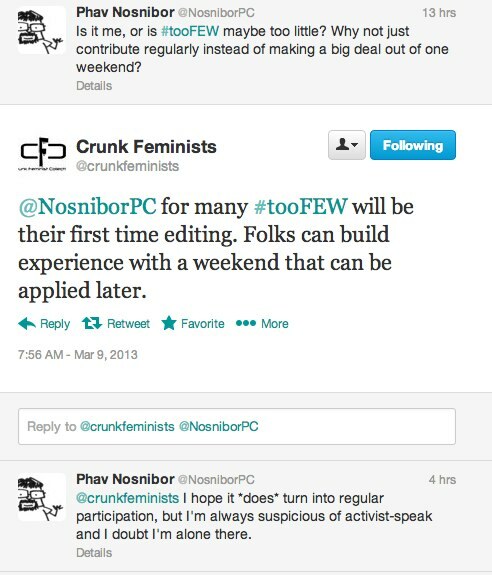 I say this to say we are working on pages that are already marginalized within Wikipedia and we are being attacked. Someone asked via Twitter, why make such a big deal about #tooFEW. Why not just edit consistently. I explained that for some this may be their first opportunity to edit. We are understood as using activist-speak for simply trying to bring together marginalized folks who are consistently edited out of history. This attack on the event page even before we start to edit is disheartening. Why would marginalized groups want to edit if this is how they are treated when they try to engage Wikipedia initially? This also has me thinking about the utility of publicity. Its wonderful to get the word out about #tooFEW but incredibly saddening that it incites attacks. We wont be thwarted though. This is exactly why #tooFEW is so necessary.